Forest Hill Doodles' mission is to provide families with dogs that will light up their lives the same way our dogs do. We are a small in-home breeder of Australian Labradoodles. The pups and their parents live with us in our home. We are located in picturesque Manchester-by-the-Sea, Massachusetts. We love our dogs! Forest Hill Labradoodles was started out of moments of sadness. The dogs that we purchased helped us recover from the passing of the matriarchs of our family. During the grieving process our family quickly discovered that our dogs were an important part of the growing process. We saw this as our opportunity to pay it forward! No matter your circumstance, as long as you give a dog a good home, an aussie dood will warm your heart, relieve your stress and make you think you are the most important person in the world. 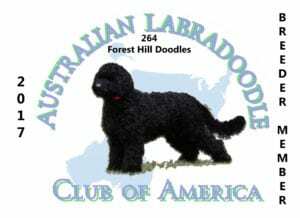 We strive for greatness at Forest Hill Doodles, which is why we are a breeding member of the Australian Labradoodle Association of America and the Australian Labradoodle Club of America. Health is our number one priority. Feel free to view our health guarantee. Our dogs go through rigorous health and genetic testing prior to breeding. Each breeding dog has its genetic profile publicly published, PennHIP testing, OFA hip and elbow testing as well as CERF eye exam. We want to make sure you have a dog that lasts its lifetime. Learn more about the Associations by visiting the ALAA and ALCA website.